The definition of Wabi-Sabi, the ‘Beauty of Imperfection’, can be present or designed and created in your home garden. Many aspects of a garden may already display this concept and should first be recognized and then appreciated. Slowing down our busy and sometimes hectic schedules can improve our health and mood. The daily relationships with the outdoors and our sense of self in the world around us is vital. By creating this feeling of peace and appreciation for the natural condition of things in our gardens we can help find relaxation and refuge from daily stresses. When I see moss growing over a rock or the fissures and cracks a boulder may have, there is a wonder and beauty felt. The age of the rock displays a sense of maturity and wisdom. Imagine the stories this rock could tell for it has seen many more years than myself and has weathered through them all. We can relate this to family, our parents and grandparents and the wisdom they share, which is and should be revered. Embracing their life experiences and history strengthens our souls and appreciation. Paying attention to those imperfections and natural occurrences, like a decaying fallen old tree full of colors and insect life or observing lichens growing over a tree branch seen supporting birds in their nest construction, is interesting and just plain cool! I feel thoughtful and serene and, in the moment, as if this is a form of meditation and understanding. 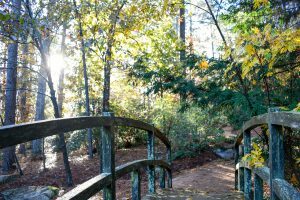 In many instances we see, fallen pine needles, leaves, twigs and pine cones across our lawns, walkways and grounds in our gardens and immediately consider needing to clean and pick them up. But wait, they may have a beautiful pattern expressed or an indication of a passing storm event and time. This is finding the beauty in imperfection. It is not always constant and permanent, but maybe for just a moment and very temporary. Yes, we all still clean up our gardens after a storm, but maybe it’s to prepare a clean canvas for the next new experience. One of my favorite Wabi-Sabi moments is noticing in the Fall when the Gingko tree drops all its leaves, seemingly together, blanketing the ground and walkway with those golden yellow shades creating patterns that are breathtaking. 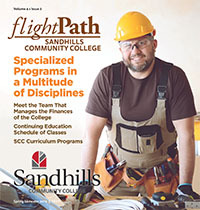 As many of you know, our students of the Landscape Gardening Program at Sandhills spend a residency period at Steed Hall and are tasked with horticultural projects, greenhouse and garden maintenance activities. Occasionally when a student skips a routine morning walkway cleaning, I’ve been told, “it was for Wabi-Sabi Mr. Westmen.” OK, you got me. My wife tells me she loves my smile lines creeping from my cheeks and eyes when I just see wrinkles and getting older. Hey, that’s my Wabi-Sabi-baby. Anyway, be observant, mindful, appreciative and discover the ‘Wabi-Sabi’ in your personal garden and, also those public ones. Find out more about our Landscape Gardening program here.